As noted in our last troubleshooting blog article, we certainly hope you don’t have problems often with wMobile, but when you do, it’s nice to have the tools to determine the issue quickly! Each component of wMobile has logs that can be viewed when a customer finds a problem. In the wMobile Explorer, you can access the log for any of the installed components on the server. Note: If you have a split install, and the Remote GoldMine Service (RGMS) is installed on another server, you won’t see the Remote GoldMine Service in the Manager Console at this time. We hope to add that functionality in the future. When viewing a log, we can filter it to show only error logs, so we can see problems more easily. 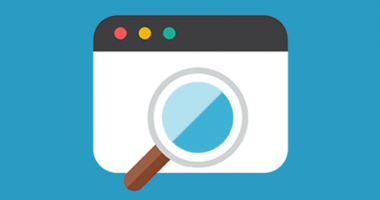 We also have a text search if we are looking for an error on a specific task or contact. 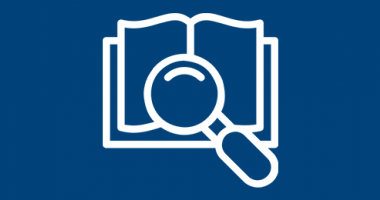 Click on Search and then enter the text to identify. Use the Previous and Next buttons to navigate through the results. If we aren’t seeing enough information, we can increase the logging level to Debug to get more information. 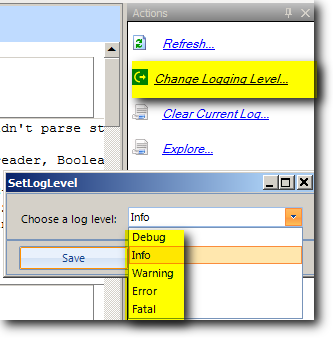 Select Change Logging Level and select Debug from the list. Click Save. On saving this change, you’ll be prompted to restart the component(s) for the change to take effect. Click OK.
We also have the option of turning on SQL logging. 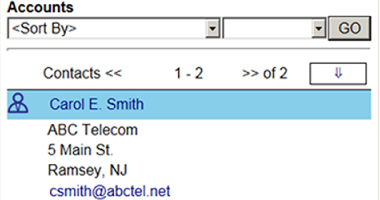 Select SQL Logs for the component in the wMobile Explorer pane as highlighted in green below. Select Enable SQL Logging in the Actions pane. Set the value to On. Click Save. As with changing the Application log level, you’ll be prompted to restart the component for the change to take effect. Click OK to do so. After the logging levels have been changed, we’d then go to reproduce the problem, so we’ll see more information in the logs to see what’s causing the problem. 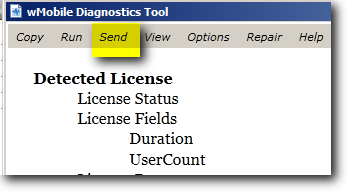 I should note that both application and SQL logs are included along with the wDiagnostic report when the SEND option is used. The logging option should be set back when troubleshooting is done, so that the logs don’t take up unnecessary space on the server drive. 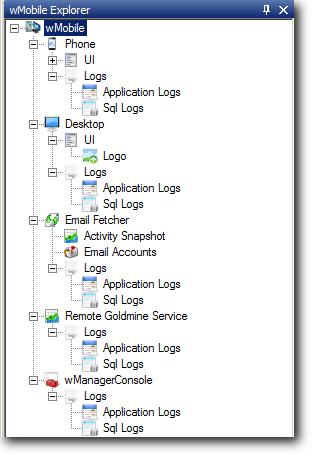 The application logs should be set back to Info and the SQL logging can be disabled, set as Off. Sometimes restarting wMobile components will solve problems as well. Changes in GoldMine settings don’t always take effect in wMobile right way. Examples of these types of changes might be adding GoldMine users, changing user permissions, changing record type rules etc. 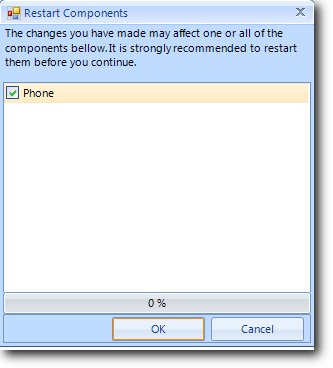 The wMobile components do get restarted or recycled periodically, but if you need to force a change to take effect right away, you can manually restart or refresh the applicable component(s). For changes to GoldMine users and permissions, restarting the Remote GoldMine service would be enough. In the example of changes to record typing, restarting the Phone and Desktop components would also be necessary. You can restart or refresh an individual component by selecting it in the wMobile Explorer pane and selecting Refresh or Restart as displayed for the component. Or, if wMobile is selected at the top of the wMobile Explorer tree, you’ll have the option to Restart All. Then you can check or uncheck the components to restart. Click OK to proceed. 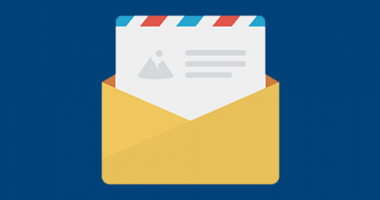 If you do experience problems in wMobile, please email to support@w-systems.com. It’s helpful if you can include a screenshot of any error, and let us know what task was done when the problem occurred. Was it on login, or completing an activity, etc. Which application were you in, wMobile Phone or Desktop? When problems are found, we certainly try to be prompt in getting them resolved for you.